The Austrian economist Joseph Schumpeter famously described the “winds of creative destruction”: a process of industrial transformation in which product and process innovations revolutionise the existing industrial structure, destroying the old one by creating a new one. But the Chancellor’s 2016 Autumn Statement – delivered just five days after the UK ratified the Paris climate change agreement – provided more of a waft than a gale. If we are serious about making the transition to a low carbon economy, we must recognise that as well as supporting innovation and deployment of low carbon technologies, it is equally important to phase out existing high carbon technologies like unabated coal fired power generation. Research from the Centre for Innovation and Energy Demand at Sussex University shows that policy makers tend to focus more heavily on policies that support the creation of new innovations, but that less attention is given to how existing, unsustainable, practices and technologies will be phased out. 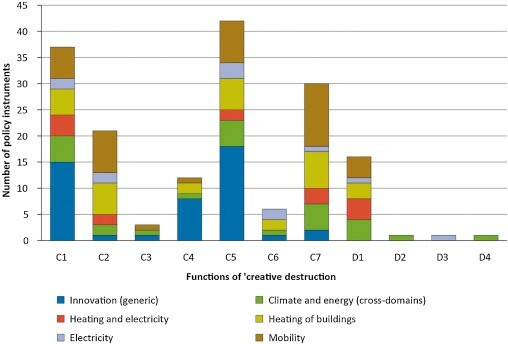 An analysis of UK policies across the heating, electricity, and mobility sectors as well as generic innovation, energy and climate policy identified 68 policies that supported the creation of new innovations (shown as C- creation functions in the figure below), but only 19 aimed at phasing out or disincentivising high-carbon technologies (shown as D-destruction functions below). Examples include the EU emissions trading scheme, the carbon price floor, and the ban of incandescent light bulbs. The UK has started to take steps in this direction with a proposal to phase out unabated coal by 2025. This should be welcomed. But while The Chancellor resisted calls to scrap the carbon floor price, his decision to continue to continue to cap the level at £18 per tonne of CO2 until 2020 was a missed opportunity. As Simon Evans from CarbonBrief has argued: “The doubling of the floor from £9 to £18/tCO2 in April 2015 has been a major factor in driving coal out of the UK electricity mix. Coal output is down two-thirds in 2016 so far, compared to the same period last year”. At £18/tonne the carbon price floor may still play a role in phasing out the use of unabated coal in the UK electricity mix but a stronger and longer term signal would have been welcome and had the potential to end coal use earlier than would otherwise be the case. It would have also worked as a hedge against potentially increasing future gas prices which could reverse the recent trend of gas replacing coal. As the Government draws up its ideas for a new industrial strategy, it needs to consider carefully not just what it wants to support, but also whether existing structures might act as a barrier to potential areas of growth, and how they might be phased out in a predictable and planned way. The plans to phase out coal are a good start, but this approach must be applied across all sectors if we are to deliver the low carbon transformation that the planet needs. Photo Credit: Mohamed Amine ABASSI: ‘Innovation’. All Creative Commons.